Easter is celebrated in the Italo-Albanian Catholic village of Piana degli Albanesi, Sicily. Not all Italian Catholics are Roman Catholics. In the south of Italy, in the regions of Abruzzo, Basilicata, Calabria and Puglia, the island of Sicily, and even just outside the walls of Rome, there are Italians who follow the Christian rites and traditions of the Byzantine East. These “Italo-Greeks” or “Italo-Albanians” form a small Catholic church that comprises two eparchies and a monastery, numbering fewer than 65,000 faithful. Although small, “the history of this 1,500-year-old church — with its highs and lows — offers insights into possible models for church unity between the Catholic West and the Orthodox East,” writes Chorbishop John D. Faris in his short history of the church. To read the full account of this fascinating story of survival, click here. During times of peace as well as war, the abuse of wives and daughters is often condoned in many communities across the Middle East. Sister Marie-Claude Naddaf knows she can’t end such widespread, deeply ingrained practices. But at the Provincial Home in Lebanon, she’s having a positive effect on women’s lives just the same. Like her fellow Good Shepherd Sisters, she views the group home they’ve established for those at-risk as an oasis of compassion. “Our mission is to support women and girls living in violence in their homes,” Sister Marie-Claude explains. “We receive women who have marital problems and they’re sometimes pregnant. We give them food and shelter. We also help children between 2 and 7 years old, and have a boarding home for girls 4 to 18 years old. Many refugee families now living in Lebanon are also receiving help, either at the Provincial Home or at other facilities run by the greater community of Good Shepherd Sisters. With no solution in sight, Sister Marie Claude admits she’ll simply continue working, as hard as she possibly can. But with so many desperate people to comfort, the sisters need more than dedication to continue their work. It’s why they need your support. Also, for a limited time, you can make your gift go twice as far. A generous benefactor is matching every donation to support the sisters between now and 1 November, All Saints’ Day. Learn more about this great gift here. 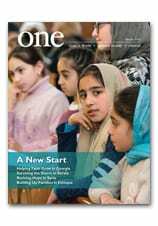 The Autumn 2015 edition of ONE is now available online and will be arriving soon in a mailbox near you. You can check it out right here. We have — appropriately — a cornucopia of inspiring news and information in this edition. Among other stories, our reporters and photographers tell how faith is growing in Ukraine, how Christians in India are standing firm in the face of persecution, and how Ethiopians are learning to adapt to an increasingly urbanized landscape. All this and more, in the new edition of ONE. And take a moment to watch Msgr. John E. Kozar’s video preview below. Migrants from Syria walk along a road in the village of Miratovac, Serbia. The immense and unprecedented refugee crisis today is heart-breaking, moving us to tears and urging us to act. As leaders of the Catholic Church in Canada, we believe that discussion is not enough; this is a time for urgent action. Every single day, desperate people try to cross a vast ocean of indifference. These people are called refugees. They are often treated simply as a problem or a concern, but to us they are our brothers and sisters, fellow human beings who need our help right now. Among other things, the bishops urge the faithful to provide moral and spiritual support to those in refugee camps; call on the federal government to expand the acceptance of refugees in Canada; and support vital aid organizations — including, most notably, CNEWA. This is a strong and powerful statement on behalf of our suffering brothers and sisters around the world. It cries out for attention. Please read the entire document and share it. And if you can, prayerfully consider supporting us in our mission — one that can help carry out our call as Christians and truly help the stranger so in need of being welcomed. If you live in Canada, please visit this page to learn how you can help. Outside of Canada, please check out this giving page. By virtue of its dominant Hellenic culture, many consider Cyprus a part of Europe. Yet this eastern Mediterranean island of 1.2 million people — divided into Greek- and Turkish-speaking zones — also figures in the annals of Asian history. Cyprus lies just 45 miles south of Turkey, 63 miles west of Syria and 120 miles northwest of Israel. The history of Cyprus is riddled with conflict. But one constant factor has maintained the isle’s Hellenic identity into the modern era: the Orthodox Church. This faith community constitutes about 90 percent of the island’s population and has served as a cultural repository and a bastion of faith even as rival Asian and European powers conquered Cyprus. From its origins in Roman Palestine, Christianity quickly took root among the many Greek-speaking populations of the Roman Empire. Largely through the evangelical efforts of Sts. Paul and Barnabas, who as described in the Acts of the Apostles first brought the faith to Cyprus, these Greek-speaking Christians formed urban communities that evolved into important Christian centers. Rather than rejecting their Hellenic culture, these churches embraced it, providing philosophical and theological vocabularies that later helped define the teachings of Jesus among the empire’s elite. The church of Cyprus, while linked to the churches of Antioch and Constantinople, flourished and became largely independent. In 488, the Eastern Roman (Byzantine) emperor, Zeno, confirmed this independence and granted the church’s metropolitan archbishop certain privileges that remain to the present day. While Cyprus was taken in the seventh century by invading Arab Muslims, for nearly 300 years Cyprus was governed jointly by Byzantine and Muslim Arab governors — an arrangement rare in the history of international law. In 988, however, the Byzantines asserted complete control and Christian life in Byzantine Cyprus flourished. Judging by the sophisticated architecture of the era’s churches and the quality of the art, Cyprus maintained close ties to Constantinople and its workshops. These ties were ruptured, however, when soldiers of the Third Crusade, led by King Richard the Lion-Hearted of England, suddenly took the island in 1191, imprisoning the Byzantine governor. The Latins reduced the power of the island’s Greek-speaking Orthodox hierarchy, exiled the archbishop and expropriated church property. Resistance was dealt with ruthlessly. Latin Catholic missionaries flooded Cyprus and founded monasteries and reordered Byzantine churches for Latin Catholic use. When Cyprus fell to the Muslim Ottoman Turks in 1570, the island’s Greek-speaking communities (who were considered neither Catholics by the Latins nor Orthodox by mainland Greek Orthodox clerics) greeted the Turks as deliverers. The sultan of the Ottoman Turks — who had taken Constantinople in 1453 and assumed the mantle of its emperors — banished the Latin hierarchy of Cyprus, recognized its long suffering Orthodox community, reconstituted its hierarchy and appointed the metropolitan archbishop as head of the Greek-speaking community, or millet. This reinforced the role of the Orthodox Church as custodian of Cyprus’s Hellenic culture, warden of the isle’s Byzantine identity and spiritual guardian of its Christians. But charging the Orthodox hierarchy of Cyprus with responsibility for governing its own people proved to be a double-edged sword.